A day in the life with Bruno the Boxer puppy. Bruno's 33rd week—39 weeks old, 81 pounds, 24 1/2 inches from the ground to the highest point of the shoulders (the withers). Bruno sure has gotten big quickly. They don't stay little for long, that is for sure. Here are two pictures to put it into perspective. 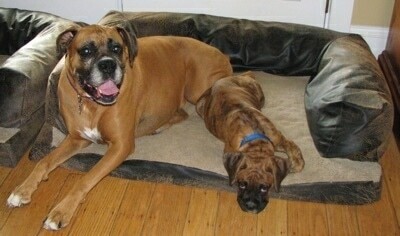 This is Bruno lying with Allie when he was a 2-month-old puppy. This is Bruno lying with Allie as a 9-month-old puppy. Bruno, you make Allie look like a midget! Bruno has been spending more and more time out of his crate. I have not put him in his crate at night in about two weeks. So far, so good. On the nights the temperatures drop well below freezing, the cat uses Bruno's crate. However, on the warmer days the cat is outside. 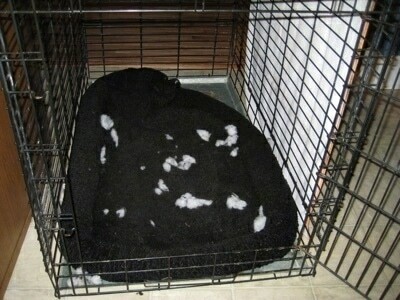 Bruno, you can thank the cat for this "out of crate" test. I would have not tried it so soon if it were not for the cat needing to be indoors until he heals. I am happy to say Bruno you are passing the test. So far, so good! 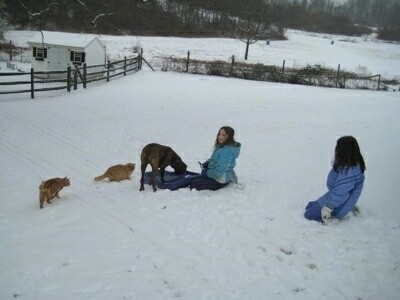 Besides going for walks/hikes, one of Bruno's favorite pastimes is hanging out with the kids. 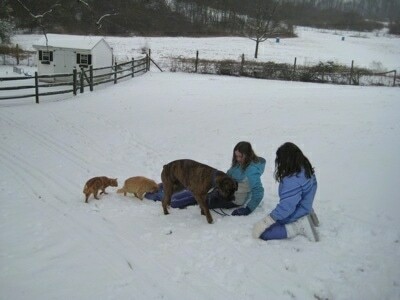 Sara and Jordan make snowballs and toss them to Bruno to eat. 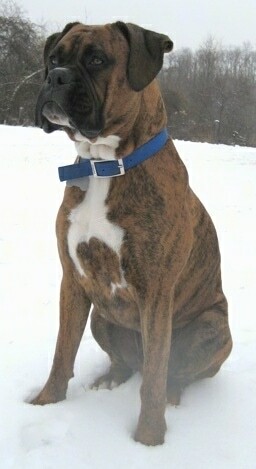 Bruno waiting for another snowball to be tossed. 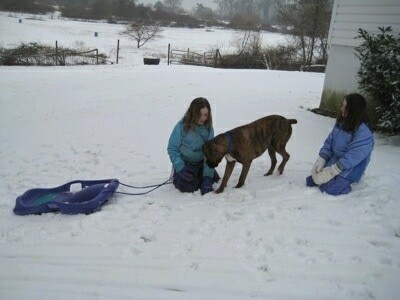 Sara is about to go sledding, but Bruno, you have to get off the sled first! Sandy and Simba the cats are hanging out too. Bruno was out on a hike. He was trotting along behind us. When we turned around to look at him, this is what we saw. 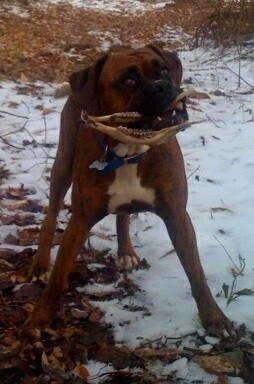 Somewhere along the way Bruno had picked up the jawbone of a dead deer. Oh Bruno, the things you find! For the past couple of days, while out on our hikes there is a spot we pass where Bruno has been jumping over some bushes to get off of the trail, and running around the woods just a bit before coming back out to the trail. I have been letting him, as whatever he was doing, it was good exercise. I was close by, but there were some shrubs blocking my full view of him. 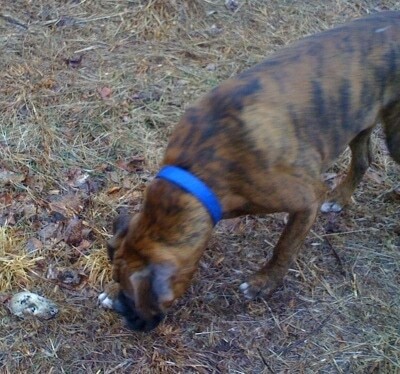 This past time when we walked by this spot Bruno came back out with this in his mouth. Bruno, drop It! Is this the same skull Bruno had before?? I just don't know. Bruno drops it. 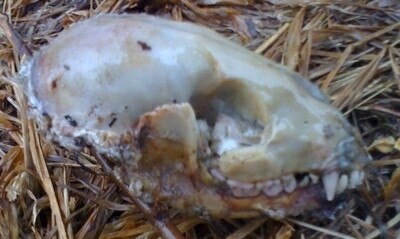 I pick up the skull and toss it deeper into the woods. Suddenly I realize my hands smell like SKUNK! I never noticed the other skull smelling like a skunk. Oh gross, if there is a head, the rest of the body is back there too! We went out for two hours, leaving Bruno out of his crate. That was the longest we had ever left him alone with free roam inside the house. 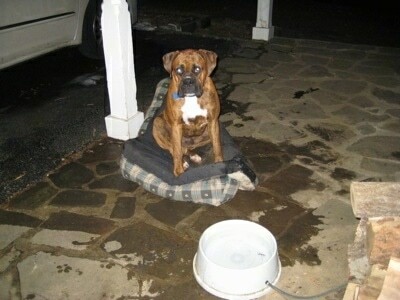 When we returned home everyone started looking around to see if he did anything bad. The only thing we could find out of place was Sara's bag of Valentine’s Day cards and candies; they had been carried from the family room coffee table (a room Bruno is not allowed to be in) and placed in the middle of the living room floor. The bag was not ripped, the contents inside the bag were not removed, nor chewed. The bag was simply carried from one room to another and placed on the floor unharmed. 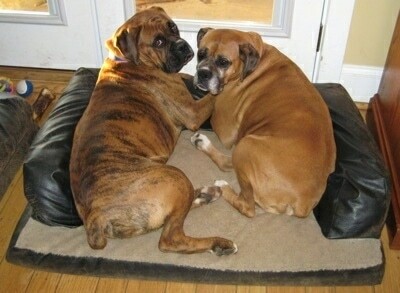 Bruno, you pulled stuffing out of your crate liner again! You know if you keep doing that it won't be fluffy anymore. When are you going to outgrow stuff like this? ?